What is the difference between the single zig zag and double on these RCA 1 Corps flashes, which would be correct for the RCA 7th A/T in italy. Hello Mike, Same reply as on the B&CMBF. The patches you have in the first image are a variety of the 1 Cdn Corps AGRA. 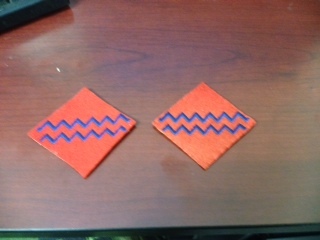 (They are shown upside down, the ends of the zigs zags should be upwards.) The double line was used to make a "red" zig zag inside the blue. Tankermike wrote: What is the difference between the single zig zag and double on these RCA 1 Corps flashes, which would be correct for the RCA 7th A/T in italy. I may be stating the obvious, but I would think the difference between a single and a double zig zag, would be one zig zag?? I will get my hat and exit stage right.